The Three marathons in three days (3M3D, Cairns, July 7th – 9th) involves running 42.2km, each day, over three consecutive days. 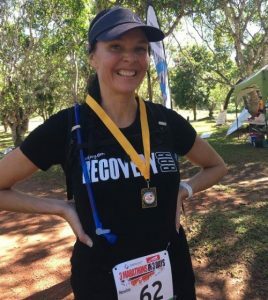 Jen set this event as one of her goals for 2017 along with running the Gold Coast Half Marathon with her 70 year old dad, Jim (finished sub 2 hours), the New Zealand Ironman with her husband Adam, (finish time of 12:34:44) and the Melbourne Marathon (set to run later this year). So when Jen came to us asking about race recovery guidance for the triple, we set out to make a event recovery plan. Hydration (electrolytes, post race snack then meal at apartment), 10min ice bath / pool, compression tights on and Boots for 60min. You can be eating and hydrating while wearing the boots.